MRS-4250 High Sheen Hot Rod Black 2.8 V.O.C. is a 2K acrylic urethane coating developed for restoration work, coating frames, engine compartments, exterior panels and other surfaces that a black satin finish is required. This product mixes 4:1 with either MRS-4255 Regular activator or MRS-4260 Slow Activator. 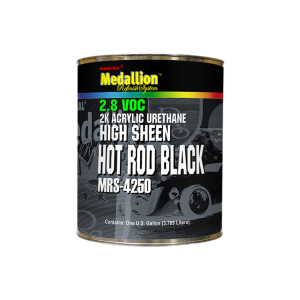 MRS-4250 High Sheen Hot Rod Black has excellent adhesion and chemical resistance. Formulated for long term durability. Available is quarts and gallons.